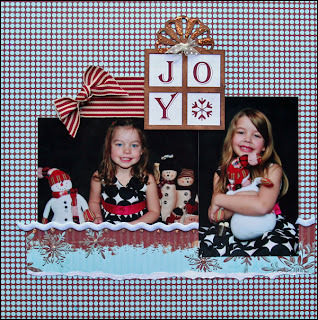 Blog Quick Quotes: Holiday Joy! QQ quotes & Design Team projects! I inked the edges of the present. I also used torn paper to add texture to my layout. To create my ribbon, I just tied a know. The smaller ribbon was done the same way. I used stickles on my present as well as below the ric rac. I also placed some stickle dots in some of the dots of the background pattern paper. The 3-in-1 Beacon glue is great for adhering chipboard to paper. I used a little on the back of the larger bow as well. I love the strength of this glue. 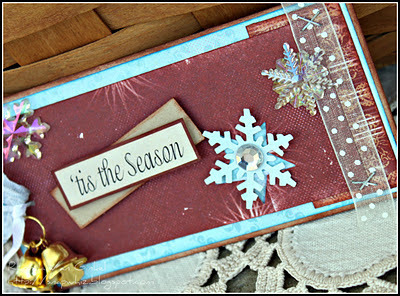 Have you checked out the new Quick Quotes Club Q kits for December? They feature our the all new line "Very Merry"! 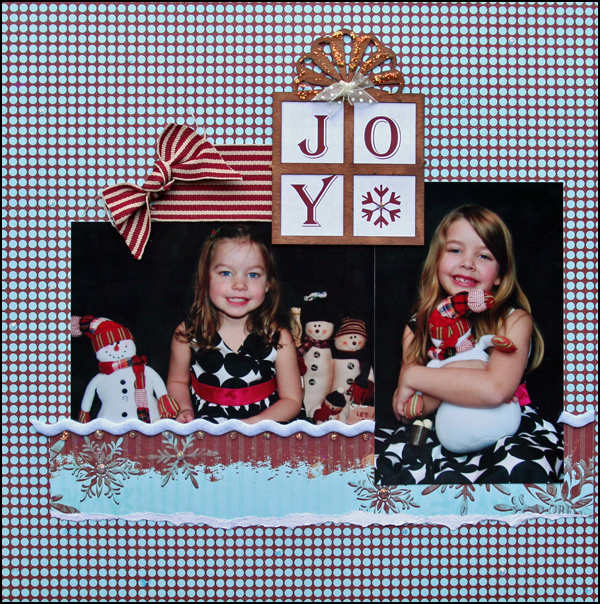 These papers are just perfect for capturing those holiday memories or creating striking cards or tags. 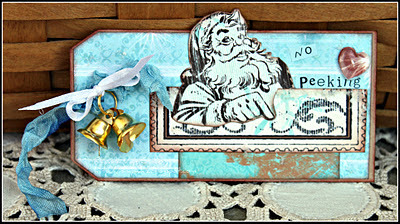 I chose to get a little jump start on my Christmas tags for my projects today. I think it's fun to have a few "extra special" tags to spruce up those gifts that you spend a lot of time selecting! I used an existing tag that I had to copy the size/shape. 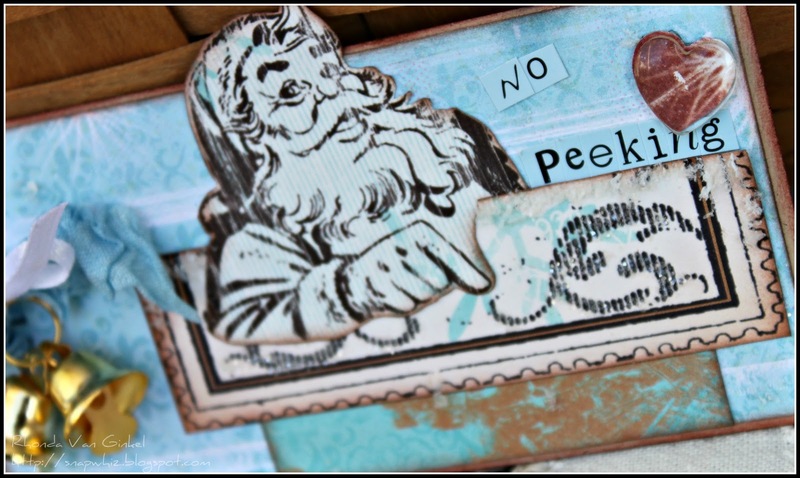 I cut Santa out from the papers and pieced a "chimney" for him to peek out of. 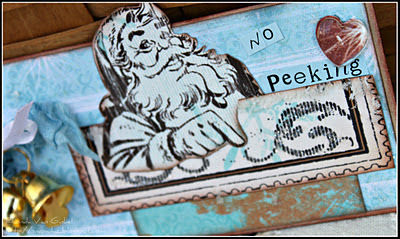 I loved how his finger was pointing so I figured the tag needed to say "No Peeking". he he! I added a little flower soft along the top of the chimney and some glitter to the flourishes. All pieces were inked with our PowderPuff Chalk Inks. 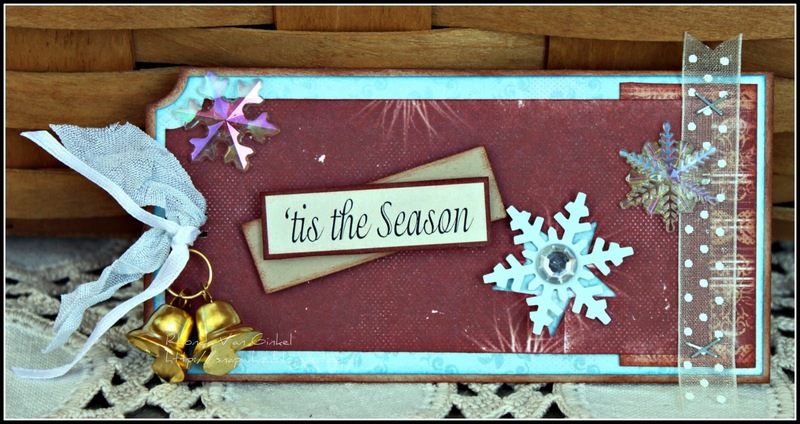 Here is my second simple tag, "Tis the Season". I used my stub corner chomper for the corners. The red layer has a star relief punched out from another project, then I layered a snowflake on top of it. I stapled my sheer ribbon for some interest. A few acrylic snowflakes added extra texture and interest. This was a really quick tag but still very fun. The bells? Those were a clearance find from the wedding section at my local Michael's. Thanks so much for spending a moment with me here today! Have a super day!!! Julie love the Joy present and the December paper is gorgeous. Also love the torn paper.Rhonda great tags. I love Santa picking out of the chimney and snowflakes are always a favorite. Thanks ladies. These are stunning! Julie, your daughter is just beautiful (I think I have said this before but she really is!) and what a lovely scrapbook page she makes. Rhonda, your tags are equally beautiful! I love the little bells you used. They really make them something extra special. What a lovely layout, Julie! Rhonda, love the tags!! Looove the way you cut out the Santa, and the jingle bells are the perfect addition!!! How lovely, I have totally fallen in love doing tags this Christmas I think it will give my gifts the pizzaz they need.